Now that the cool breeze is just around the corner, winter wardrobes, as expected are starting to hit high demands in the market. Boots in particular are just some of the season's requirements so you can enjoy going outdoors even when the snow is falling. In the United States and in Europe, ugg boots are so popular not only because they are comfortable to wear, but also because of their fashionable and sleek designs. I actually have some friends who are into these boots and they are always dying to get the latest collections. 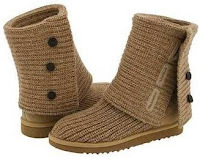 I was surfing through the ugg website a couple of hours ago and I was amazed on the different boots colors and designs displayed on the site that are categorized accordingly to make online shopping hassle free. Another thing that surprised me is their ugg boots sale promotion wherein you can avail from 50% to 70% discount on the items. Have a look so you can start choosing your boots.